I often speak about my passion for the engineering side of corsetmaking, but it occurred to me that many clients don’t understand how their bespoke corset is made in the first place. When the beautiful Edith Emerald asked me to take some behind the scenes photo’s of her commission for her blog it seemed a perfect opportunity to share some of the techniques that I use in the studio, and that you may never have realised play a part in your corset’s existence. When you send over your measurements, we use them to draft you a unique pattern that responds to your individual body lengths and circumferences. 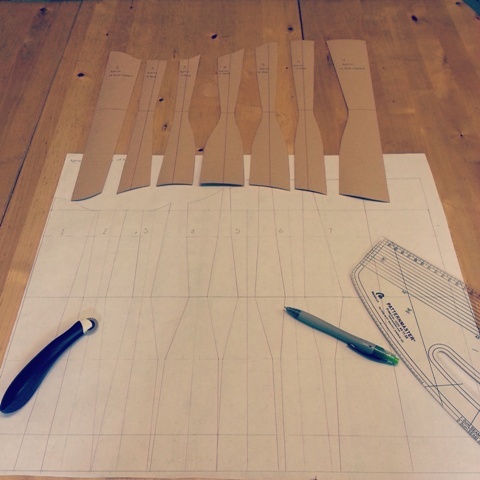 This shows two stages of the patternmaking process, the working pattern (paper) where the dimensions are laid out in basic form and the production pattern (cardboard) where the style lines and shaping are fine tuned. 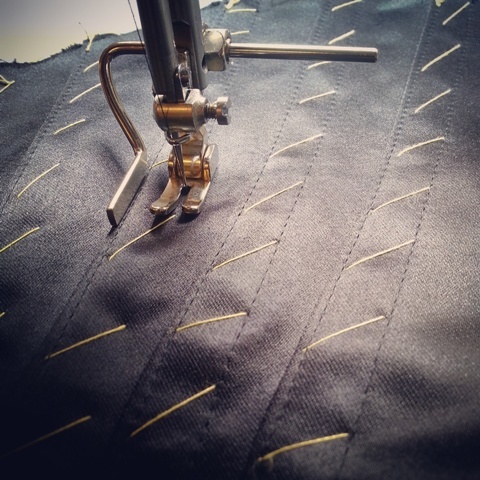 This process differs depending on whether you are having a double coutil corset, a four layer corset, a summer mesh corset or a single coutil layer with fashion fabric and lining like Edith, but each seperate layer is cut with care from your pattern, taking care to follow grain lines in the fabric so as to retain the strength of the weave. The three separate layers have all been cut out, a base layer of cotton coutil, a duchess satin fashion fabric for a silky finish and a light cotton lining. 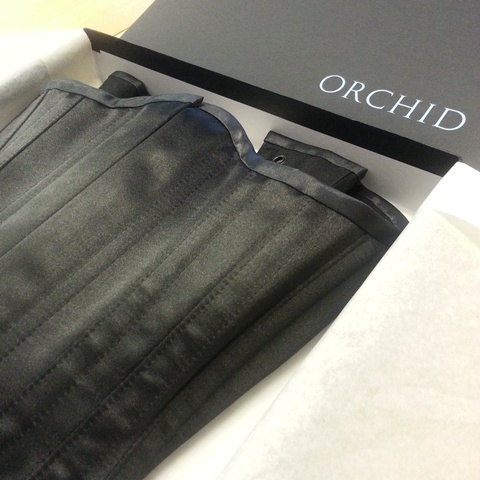 This will make a sturdy but lightweight corset suitable for summer use and for discreet wear under clothing. 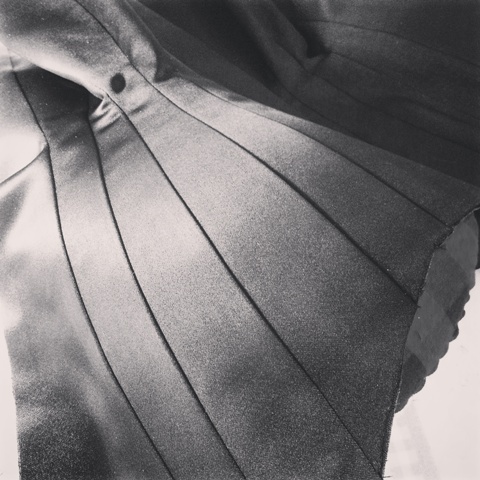 Once the panels of the corset have been sewn together and the sizing carefully checked it’s time to press the work so far, using steam, heat and pressure to get the desired sleek effect over the contours and seams. In many ways, this is where the magic happens! I always dedicate a good amount of time to pressing a corset. First it’s pressed from the inside, using a tailors ham and wooden clapper for a sharp finish on the seams, and then from the outside with a cloth to protect the fabric. Each seam is allowed to cool completely before it’s moved to let the fabric take on the moulded curve I’m pressing into it. Because Edith’s corset used a single strength layer (the coutil) we are using boning tape stitched inside the corset to securely retain the steel boning rather than stitching the channels through multiple layers of cloth as we would do on a 4 layer corset. This is hand stitched (or basted) into position to allow for the most effective and attractive top stitching. Internal boning channels are hand stitched in place before going under the sewing machine so that the stitching can be done from the top giving the neatest possible finish. When the channels are stitched the tacking is unpicked leaving perfect, secure boning channels. No corset would be complete without it’s steel skeleton! 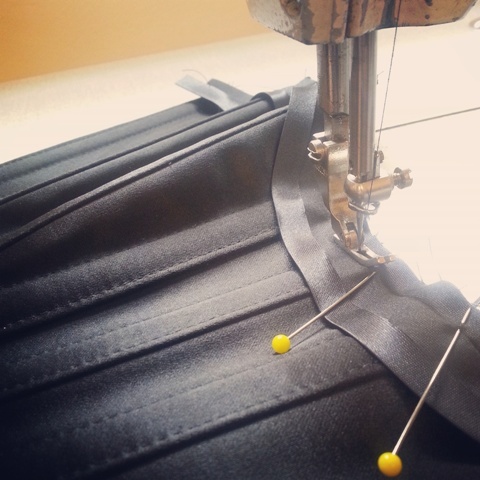 many people don’t realise that the steel boning is not there to reduce the waist (this is done at the pattern making stage with how we shape the panels) but in fact to hold the fabric taut and prevent the corset wrinkling and folding under pressure at the waist. The boning gives tension and support to the figure but does not actually change your waist shape. 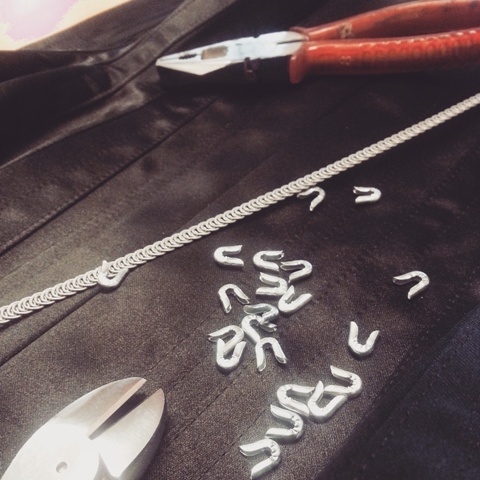 After the boning channels are stitched all the spiral steel bones are individually cut and tipped to ensure accuracy and also in order to use a higher tension of boning than is available pre-cut. This particular steel gives a lovely firm hug that is resistive but comfortable to wear. Here you can see the first stage of attaching the binding which finishes the top and bottom edges. This is machine stitched from the inside ready for hand finishing later on, which gives a neat and visible stitch free result. 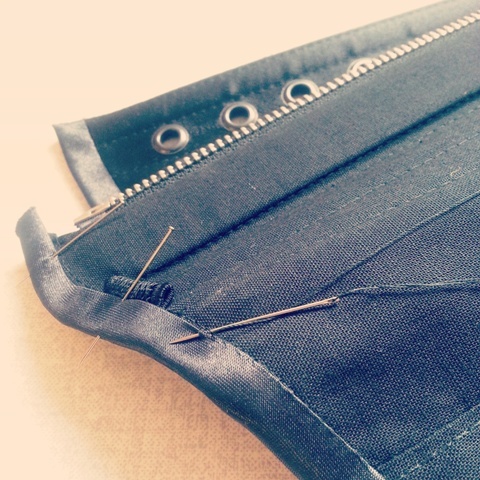 One of the final tasks is to hand sew the binding closed from the inside of the corset. This means that no stitching is visible and is just one of the many little hand finishes that make a bespoke corset so special. 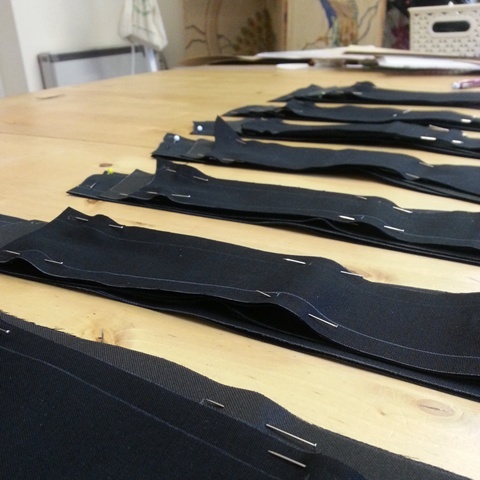 It will usually take around an hour and half for this stage of the corsets construction. 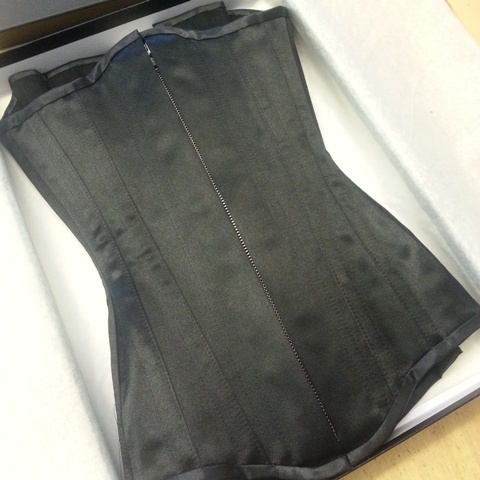 With all the labour complete, it’s time to package the corset and send it off to it’s new owner! This corset uses a hidden zip for a front fastening, and is made in beautiful ebony duchess satin. Duchess satin is incredibly hard to capture on camera, it’s lustre is subtle and glowing but you may just have to take my word for that! However I was delighted with the graceful curves this corset held even. while not being worn. You can read more about Edith’s adventures here, and find on her on Instagram for her latest updates and stunning vintage inspired portraits.